Type 1 - Blotter with straps: Upholstery weight leather with a suede underside, with straps made with English bridle leather. Hand stitched over a 1/8” hard substrate. Blotter thickness: 3/16”. Octavio desk with blotter made with Moore & Giles Diablo: fudge, with English bridle leather straps in havana. 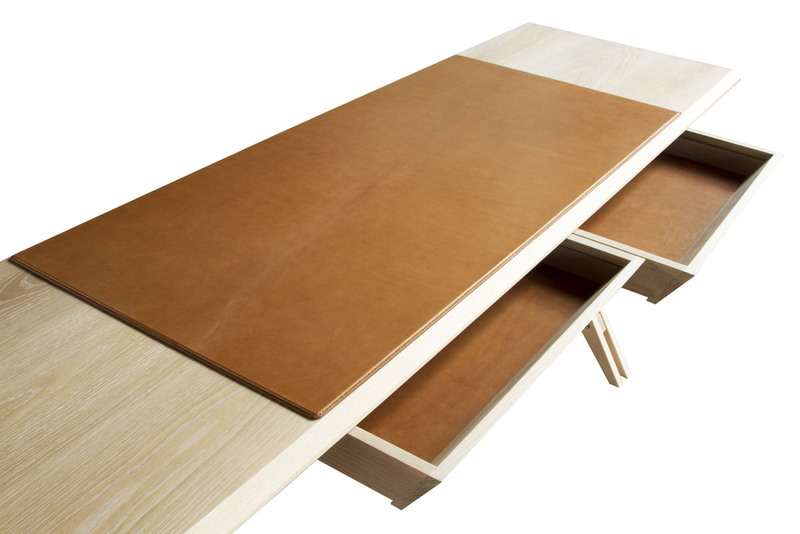 Octavio desk with blotter made from Moore & Giles, Diablo: acorn. Type 2 - Blotter without straps: Upholstery weight leather with a suede underside, hand stitched over a 1/8” hard substrate. Blotter thickness: 3/16”. Made to order, price per sq. ft. If you would like a greater variety of colors and textures to choose from, you can visit the Moore & Giles website and order samples directly.